We've been focused on storms here on Earth lately, but there's been activity on the sun, too. On Wednesday last week (September 6, 2017), the sun produced an unusually large solar flare. This flare results in an increased likelihood of auroras lighting up the night sky here on Earth. To learn more about how this works, let's look at the timely middle grade book Stories of the Aurora: The Myths and Facts of the Northern Lights by Joan Marie Galat and illustrated by Lorna Bennett. As the title suggests, Stories of the Aurora is a combination of science and folklore. On the folklore side are legends from Inuit, Norse, Greek, and other cultures. On the science side, readers learn about the Earth's magnetic field, how the auroras form, how they behave, and the environmental effects of auroras. It's a surprisingly informative mix. For example, on page 18 we learn that the Sami (also called Laplanders) call the aurora "The Light You Can Hear." This might not make sense until the sidebar on page 30, when we learn people for centuries have reported hearing crackling and hissing sounds during bright auroras. In 2012 scientists were able to verify the sounds and lights were related and began to piece together how they are created. In this video you can hear some recordings of the sounds (towards the middle of the lecture, about 1:30). Sometimes they sound like clapping. Isn't that amazing? Auroras making sounds is just one of the cool things readers will discover in Stories of the Aurora. This award-winning title will surely light up the faces of youngsters interested in finding out more about their world. The Aurora Borealis (Northern Lights) and Aurora Australis (Southern Lights) occur when waves of charged particles traveling as solar winds from the sun strike the gases in the upper atmosphere of the earth and make the gases glow. 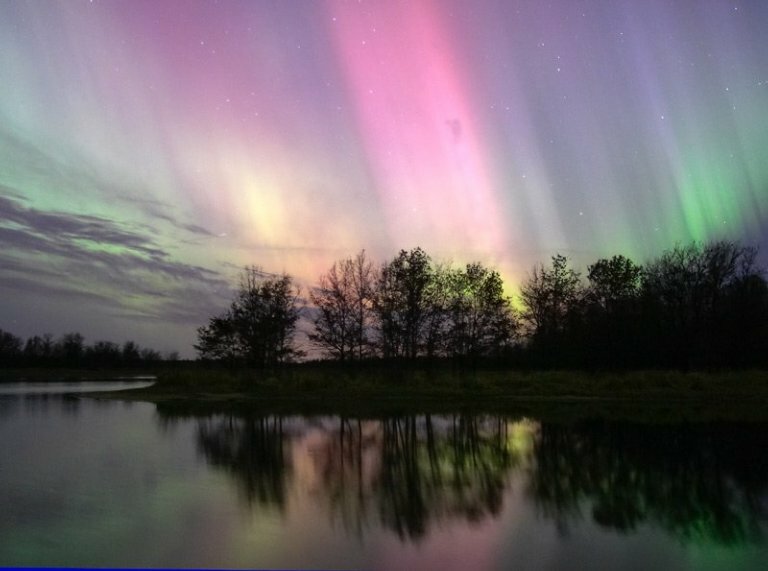 The Northern Lights typically occur around the Arctic Circle, but large flares can cause a glow that can be seen throughout Canada and into the northern United States. Here is a photograph of an aurora taken in Wisconsin. Predicting when an aurora will occur is difficult, and at best happens only two or three days after an observed solar flare. Often scientists can only give about 30 minutes notice. Check the NOAA Aurora website to learn about current predictions. Visit the author's website for a list of links to cool aurora and general astronomy sites to visit. Collect images of auroras. Make a poster, lapbook, or slide presentation explaining how they form and facts about them. For example, find out why are some auroras green, some red and some a mix of colors. Share your results. NASA has a free .pdf aurora poster and lesson to get you started. Try an art project with colorful auroras as a backdrop to arctic animals. Oil pastels on black paper can give a lovely effect. Add some black silhouettes of trees or land forms to the bottom for contrast. The book is the 2017 SCBWI Crystal Kite Award winner for the Canada region and 2017 Skipping Stones Honor Award winner. Disclosure: Book was provided by the publisher for review purposes. Also, I am an affiliate with Amazon so I can provide you with cover images and links to more information about books and products. As you probably are aware, if you click through the highlighted title or cover links and purchase a product, I will receive a very small commission, at no extra cost to you. Any proceeds help defray the costs of hosting and maintaining this website.